On top of the list of museums within the Palace of Culture was “Stefan Procopiu” Museum of Science and Technology. Or in other words sort of a “knock-knock, who’s there”, because we expected one thing and we found something totally different. Although the first section of the museum was the energy department, founded in 1961, instead of being presented the main forms of energy that were used, we entered the world of music. Currently arranged for the renovation project of the Palace of Culture, what greets us at the entrance of the museum is the department of recording sounds and playback, opened in February 1966. It includes a song performance, featuring the chronological evolution of sounds recording and playback. All the instruments it includes delight the eye and capture the viewer’s full attention, even without being put into action. When they`re turned on to do a demonstration, these musical hybrids became real beings that move gracefully and “voice” in hypnotic rhythms. Each of them tells differently the story about the era they were born, being genuine gateways to the past. This collection of ingeniously constructed musical automates has a design derived from “Wonderland” where Alice got lost, because each item is shown in perfect harmony with the other, united in perfect and surprising embraces. Boxes and musical watches, symphonions and polyphones, mechanical pianos, turntables and gramophones, the multitude of models and recording supports such as cylinder pin discs, cardboard or perforated metal discs, perforated tapes, vinyl records, all have their well-deserved place in the only museum of this type in Romania. Here’s how we directly enter the story, completely forgetting about the methodical labor of what is behind art. We go back to technique as we slowly leave behind the musical notes which become faded in the background, and we visit other sections of the museum. 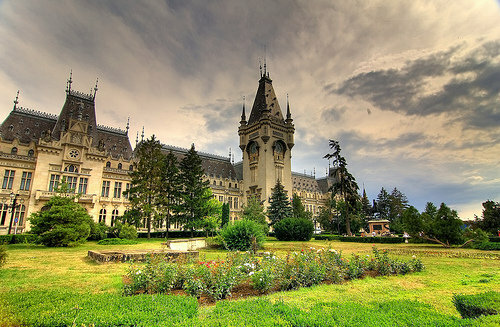 Along with the energy sector, which includes electric machines used in the laboratories of the University of Iasi in the late 19th century, and which were built by prestigious companies such as: Gramme, Schuckert, Siemens, Ganz, Thomson, Brown-Bovery and others, or arc lamps that illuminated Iasi in the early 20th century, the museum also includes a sector of telecommunications, opened in 1984, a section of “Mineralogy- Crystallography” and a newer one, opened in 2004, called the Computer Section. The four museums that make up vast exhibitions within the Palace of Culture (The History Museum of Moldova, “Stefan Procopius” Museum of Science and Technology, The Ethnographic Museum of Moldova and The Art Museum”) represent the core of the visit, although we have to admit we fell in love with the last details that were so sweet in appearance as the cherry on the cake. The valuable pieces from exhibitions like “Romanian Gold and Silver” and “Art and ceremony on royal tables” which were made especially for the official opening of the Palace, delighted our senses and imagination, stealing our attention with their dazzling glow which seduced both our eyes and soul. We rejoiced at so much beautiful richness that we got dizzy! And again we got dizzy at the clock tower, where we climbed with enthusiasm to listen an old engineer who by combining history with mechanics explained us the meaning of the mysterious multitude of rollers which were dancing in the rhythm of time! Through the immense stained glass windows we could gaze upon the gorgeous view of the city. A unique landscape could be seen from what is the “heart” of the Palace, a heart that is incessantly ticking and carrying the weight of years sifted in seconds.